Description: Daily Mass is at 8:30 a.m. in the church, followed by the rosary in Mary's Chapel. Description: Join us after the 8:30 a.m. Mass for First Friday Breakfast. 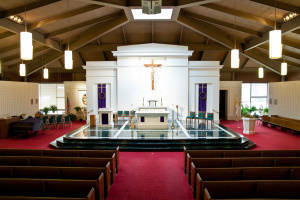 Description: Join us for the First Friday Evening Mass each month at 6:30 p.m. in the church. Description: Join us to celebrate Mass in the church every Saturday at 5:00 pm. Description: Join us as we pray the rosary dedicated to the Immaculate Heart of Mary followed by the Chaplet of the Divine Mercy every First Saturday after the 5:00 p.m. Mass, in Mary's Chapel. Description: Join us for singing, teaching, healing and adoration every first Wednesday of the month. Description: If you would like your child baptized, come on the second Sunday of the month at 12:45 p.m. Description: Ultreya means "onward" in Spanish, and is a monthly gathering for prayer, small group sharing and a witness talk. Everyone is welcome, especially those interested in Cursillo (a 3-day retreat). Description: The parish council meets in the rectory basement. Description: We invite children of our parish to join this ministry of prayer. Description: All parishioners are welcome to join this organization that works to celebrate our cultural diversities. Description: Infant Baptisms are held on the fourth Sunday of the month. Baptism prep classes are held on the second Sunday of the month, both at 12:45 p.m.
Daily Mass is at 8:30 a.m. in the church, followed by the rosary in Mary's Chapel. Join us after the 8:30 a.m. Mass for First Friday Breakfast. Join us for the First Friday Evening Mass each month at 6:30 p.m. in the church. Join us to celebrate Mass in the church every Saturday at 5:00 pm. Join us as we pray the rosary dedicated to the Immaculate Heart of Mary followed by the Chaplet of the Divine Mercy every First Saturday after the 5:00 p.m. Mass, in Mary's Chapel. Join us for singing, teaching, healing and adoration every first Wednesday of the month. If you would like your child baptized, come on the second Sunday of the month at 12:45 p.m.
Ultreya means "onward" in Spanish, and is a monthly gathering for prayer, small group sharing and a witness talk. Everyone is welcome, especially those interested in Cursillo (a 3-day retreat). The parish council meets in the rectory basement. We invite children of our parish to join this ministry of prayer. All parishioners are welcome to join this organization that works to celebrate our cultural diversities. Infant Baptisms are held on the fourth Sunday of the month. Baptism prep classes are held on the second Sunday of the month, both at 12:45 p.m.